Clinohumite is an uncommon member of the humite group, a magnesium silicate according to the chemical formula(Mg,Fe)9(SiO4)4(F,OH)2. The formula can be thought of as four olivine (Mg2SiO4), plus one brucite (Mg(OH)2). Indeed, the mineral is essentially a hydrated olivine and occurs in altered ultramafic rocks and carbonatites. 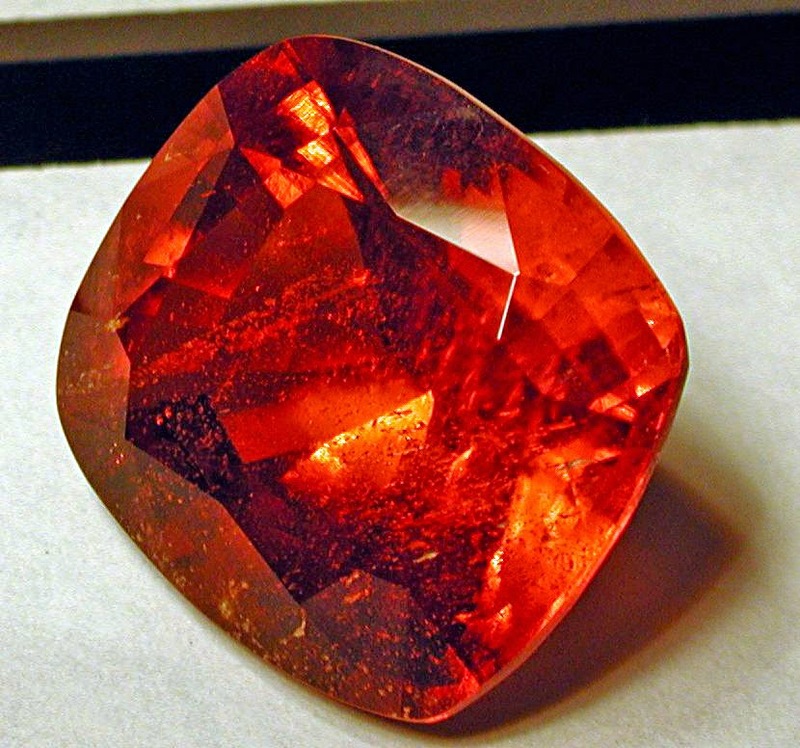 Most commonly found as tiny indistinct grains, large euhedral clinohumite crystals are sought by collectors and occasionally fashioned into bright, yellow-orange gemstones. Only two sources of gem-quality material are known: the Pamir Mountains of Tajikistan, and the Taymyr region of northern Siberia. It is one of two humite group minerals that have been cut into gems, the other being the much more common chondrodite. Emerald is a gemstone and a variety of the mineral beryl (Be3Al2(SiO3)6) colored green by trace amounts of chromium and sometimes vanadium. Beryl has a hardness of 7.5–8 on the Mohs scale. Most emeralds are highly included, so their toughness is classified as generally poor. Lapis lazuli is a deep blue semi-precious stone that has been prized since antiquity for its intense color. Lapis lazuli is a rock whose most important mineral component is lazurite (25% to 40%), a feldspathoid silicate mineral with the formula (Na,Ca)8(AlSiO4)6(S,SO4,Cl)1-2. Most lapis lazuli also contains calcite (white), sodalite (medium blue), and pyrite (metallic yellow). Other possible constituents: augite; diopside; enstatite; mica; hauynite; hornblende, and nosean. 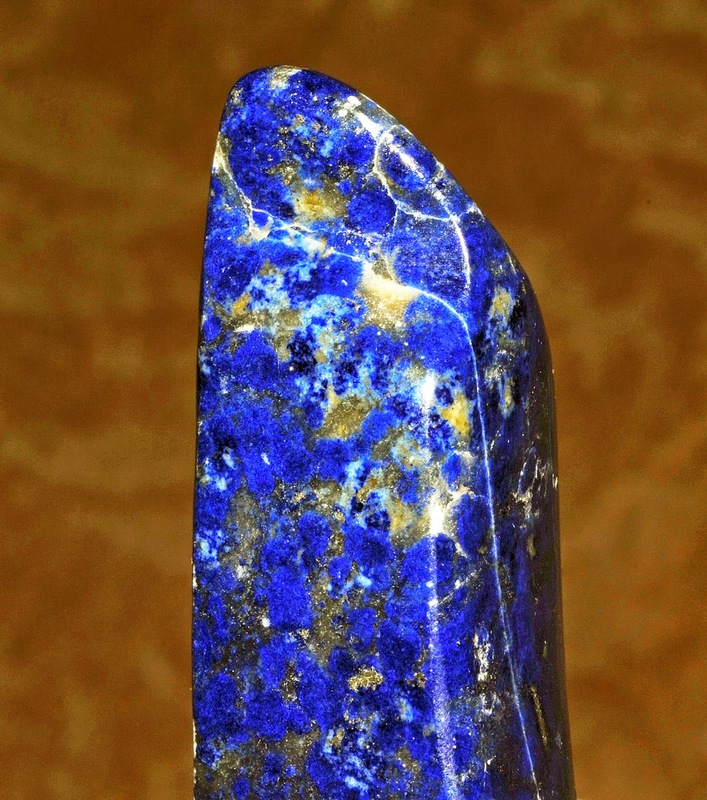 Some lapis lazuli contains trace amounts of the sulfur-rich löllingite variety geyerite. Fluor-liddicoatite was named in 1977 after Richard T. Liddicoat (1918–2002) gemmologist and president of the Gemological Institute of America, who is well known for introducing the GIA diamond grading system in 1953. 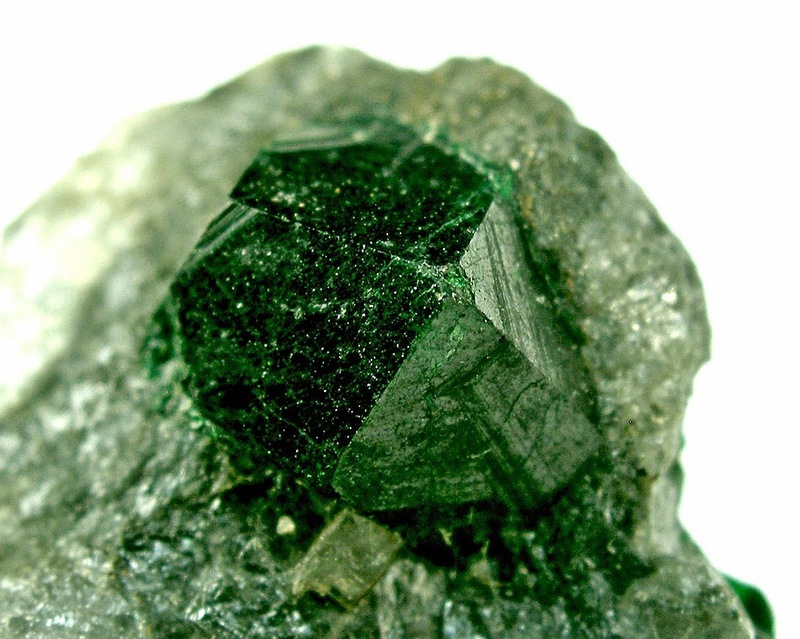 Uvarovite is a chromium-bearing garnet group species with the formula: Ca3Cr2(SiO4)3. 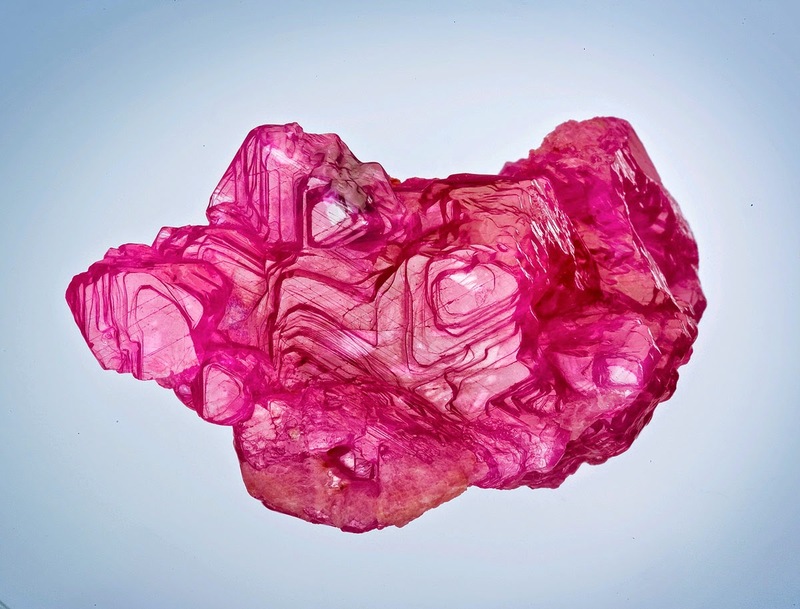 It was discovered in 1832 by Germain Henri Hess who named it after Count Sergei Semenovitch Uvarov (1765–1855), a Russian statesman and amateur mineral collector. Uvarovite is one of the rarest of the garnet group minerals, and is the only consistently green garnet species, with an emerald-green color. It occurs as well-formed fine-sized crystals. Benitoite is a rare blue barium titanium silicate mineral, found in hydrothermally altered serpentinite. Benitoite fluoresces under short wave ultraviolet light, appearing bright blue to bluish white in color. 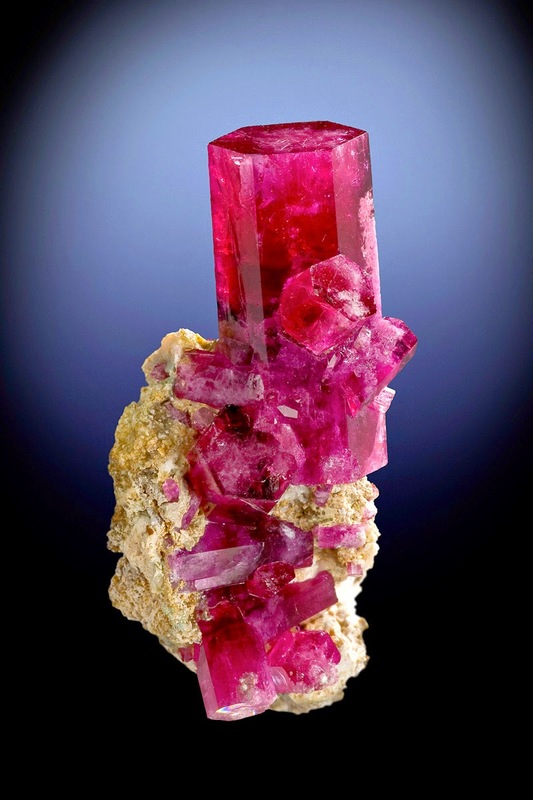 The more rarely seen clear to white benitoite crystals fluoresce red under long-wave UV light. It was first described in 1907 by George D. Louderback, who named it benitoite for its occurrence near the headwaters of the San Benito River in San Benito County, California. 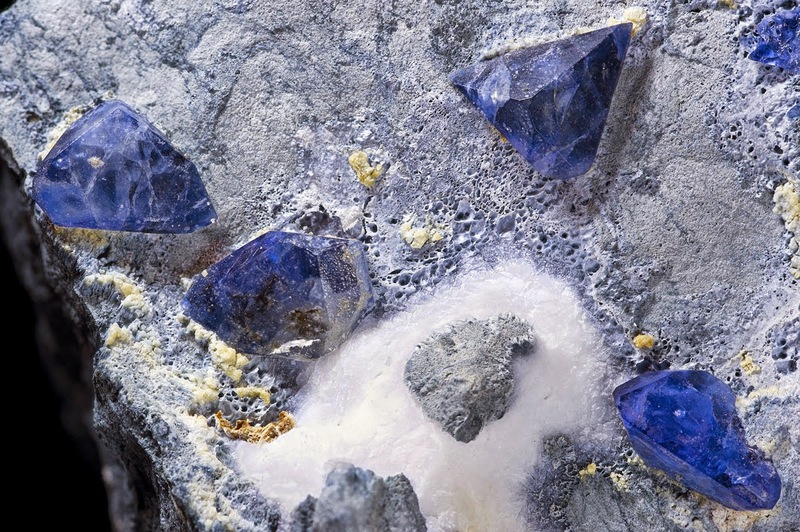 Benitoite occurs in a number of sites, but gemstone quality material has only been found in California. In 1985 benitoite was named as the official state gem of California. Benitiote has a rare 5 pointed crystal form, and an even rarer 6 pointed form, "star of David", with about 24 samples known. Beryl is a mineral composed of beryllium aluminium cyclosilicate with the chemical formula Be3Al2(SiO3)6. 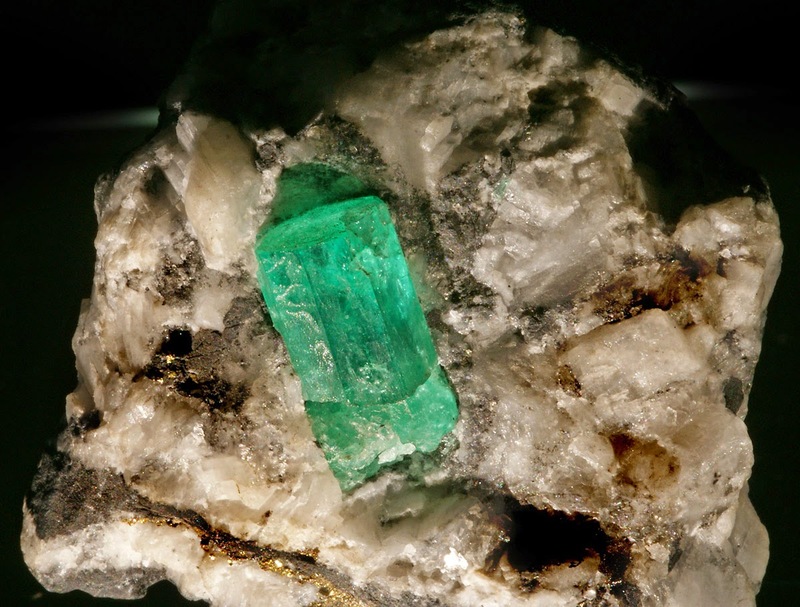 The hexagonal crystals of beryl may be very small or range to several meters in size. 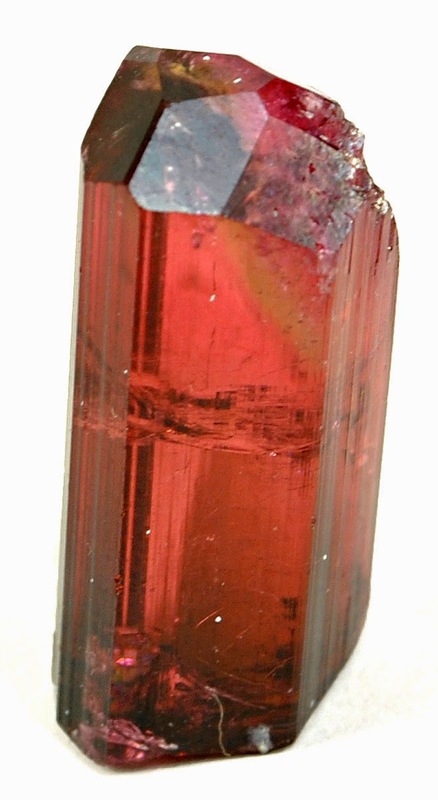 Terminated crystals are relatively rare. Pure beryl is colorless, but it is frequently tinted by impurities; possible colors are green, blue, yellow, red, and white. Tanzanite is the blue/violet variety of the mineral zoisite (a calcium aluminium hydroxyl Sorosilicate) belonging to the epidote group. It was discovered in the Mererani Hills of Manyara Region in Northern Tanzania in 1967, near the city of Arusha and Mount Kilimanjaro. Tanzanite is used as a gemstone, and naturally-formed tanzanite is extremely rare, still found only in the Mererani Hills. Tanzanite is noted for its remarkably strong trichroism, appearing alternately sapphire blue, violet and burgundy depending on crystal orientation. 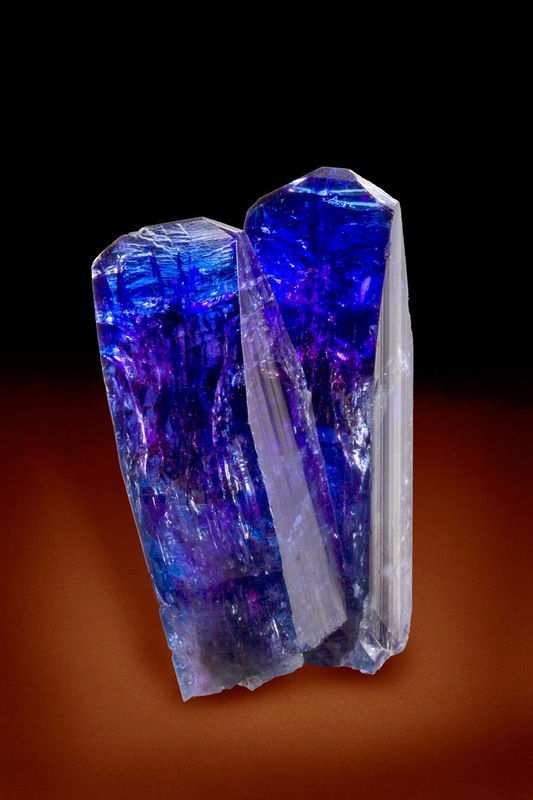 Tanzanite can also appear differently when viewed under alternate lighting conditions. The blues appear more evident when subjected to fluorescent light and the violet hues can be seen readily when viewed under incandescent illumination. Tanzanite is usually a reddish brown in its rough state, requiring artificial heat treatment to bring out the blue violet of the stone. 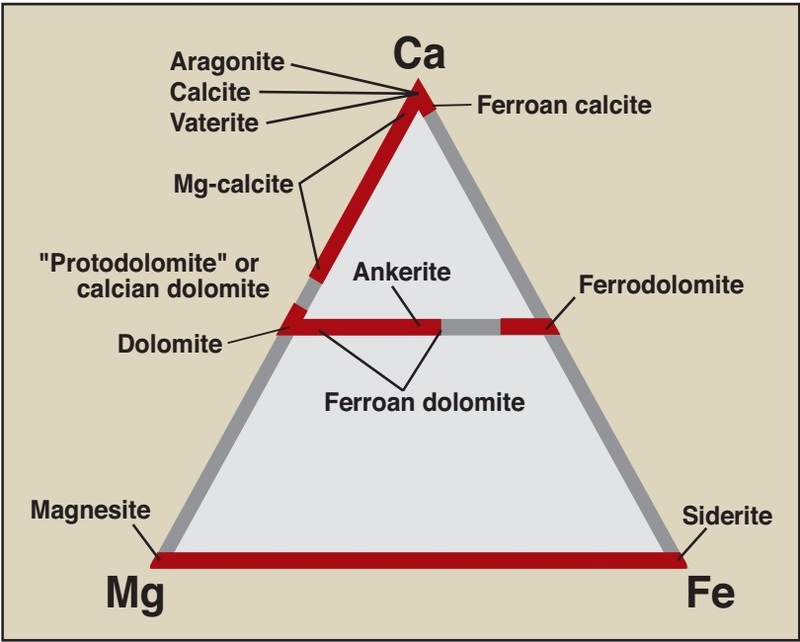 There are several types of stratigraphy that are described below. Geochronology, the science of absolute dating of rocks and determining the time sequence of geological events in Earth's history, particularly by radiometric dating, developed largely at the turn of the 20th Century and during its first three decades with the advent of atomic and nuclear physics and quantum theory (e.g. Holmes, 1911; see also Hole, 1998, for a review). It provided the framework of absolute time within which the relative chronostratigraphic scale could be calibrated. The work of Rutten (1959) presented a chronological scale of polarity reversals of the Earth’s magnetic field based on K–Ar radiometric dating in a sequence of volcanic rocks, and gave birth to the new science of magnetostratigraphy. Harrison and Funnel (1964) discovered that magnetic polarity reversals (chrons) are also recorded in marine deposits, which further improved the applicability of the technique. Subsequent works aimed to match and calibrate the reversals with conventional stratigraphic tools (ISSC, 1979; Tarling, 1983; Galbrun, 1984), and use the unique nonperiodic pattern of reversals to date and correlate diferent rock sequences. In combining the marine magnetic anomalies measured over the sea-floor record in the South Atlantic spreading profile with their dates of chrons on land, Jim Heirtzler and colleagues in 1968 laid the foundation for the modern timescale based on Cretaceous through Paleogene marine magnetic anomalies, also known as the Geomagnetic Polarity Time Scale (GPTS). The Cande and Kent (1995) GPTS is the currently accepted timescale that is in most widespread use. In 1976 the International Subcommission on Stratigraphic Classification (ISSC) of the International Commission on Stratigraphy (ICS) published the first edition of the International Stratigraphic Guide (edited by Hollis D. Hedberg),as a means to promote international agreement on the principles of stratigraphic classification, terminology, and rules of procedure. In 1983 the North American Commission on Stratigraphic Nomenclature proposed a version of the stratigraphic code, which expanded considerably its original scope. The standard international stratigraphic classification was finally approved in 1987 by the ISSC, and updated in 1994 in a second edition of the Guide (Salvador, 1994). An abridged version was published by Murphy and Salvador (2000), and made available on the ICS website. General comments on stratigraphic principles and procedures have also been presented by various authors, such as Reading (1978), Ager (1984), Blatt et al. (1991),and Whittaker et al. (1991), among others. The term and concept of stratigraphic facies (from Latin: appearance, aspect, face, form), meaning the combined lithological and paleontological characteristics of a stratigraphic section, were introduced in 1838 by the Swiss geologist and paleontologist Amanz Gressly (1814–1865) from his studies in the Jura Mountains. Gressly's pioneer contributions on the genesis and applications of sedimentary facies, stratigraphic correlations, and paleogeographic reconstructions are fundamental to modern stratigraphy (Cross and Homewood, 1997). Later in the course of the 19th Century the term was assigned to a variety of descriptive meanings by geologists, paleontologis and ecologists, which somehow confused the original definition. Facies analysis in the modern sense restored the concept to its original meaning, aiming at the description, interpretation and reconstruction of the depositional and paleogeographic setting of sedimentary units, combining lithological and paleontological data (Reading, 1978, 1996; Walker, 1979, 1992; Walker and James, 1992). It provides the basic framework to reconstruct the environmental evolution of the stratigraphic record through time. Various graphical, numerical and experimental methods applied to refining stratigraphic resolution and basin modelling studies, have been continually developed since the 1960's (e.g. Shaw, 1964; Ager, 1973; Miller, 1977; Van Hinte, 1978, 1982; Gradstein et al., 1985; Mann and Lane, 1995; Harbaugh et al., 1999; Paola et al., 2001). These techniques have jointly the greatest potential to achieve the finest biostratigraphic resolution possible in correlating different rock sequences, in studies of regional versus global correlation of geological events, in helping to reconstruct the geological history of sedimentary successions, and in petroleum reservoir correlation and modelling. The methods are greatly assisted by the universal adaptation of microcomputers to digital programming with colour graphics output. Modern stratigraphy had a major impetus by the mid-20th Century, with the increase of petroleum exploration activities,the development of new technologies (e.g. of seismic reflection data in the 1970s) and the application of stratigraphic models to petroleum research (e.g. Sloss, 1962). In 1949 L. L. Sloss and coworkers coined the term sequence to represent a set of sedimentary cycles limited by unconformities. The notion of unconformity-bounded stratigraphic units received further support in the late 1950s with the works of H. E. Wheeler (1958, 1959a and b), who also introduced the concept of the chrono-lithostratigraphic chart. In 1963 Sloss consolidated the term stratigraphic sequence and its usage in regional chronostratigraphic correlations. These studies provided the basic framework to the later formulation of the sequence models, which was to incorporate the use of high-quality seismic-reflection data in modelling subsurface stratal patterns and general geometry, and the expected seismic reflection features of different lithofacies asssociations. In a series of publications starting in the late 1970s, Peter Vail, coworkers and colleagues presented a revolutionary stratigraphic method of basin analysis for what became known as "Sequence Stratigraphy" (e.g. AAPG Memoir 26, edited by Payton, 1977; Vail, 1987; Van Wagoner et al., 1987, 1988, 1990, 1991; Posamentier et al., 1988, 1992; Posamentier and Vail, 1988; Vail et al., 1991; Schlager, 1992; Walker and James,1992; and Posamentier and Allen,1994,among others). Sequence models constitute a powerful tool for unraveling basin-fill history, and as such have been applied to most stratigraphic studies of basin modelling. The method is based on the study of the relationships between global relative sea-level changes and large-scale sedimentary cycles within time-equivalent depositional successions bounded above and below by a significant gap in the stratigraphic record, i.e., by surfaces of erosion (unconformity-bounded units) or nondeposition. Suess (1906) was the first to propose that sealevel changes could be global. The global eustatic sea-level variation curve proposed by Vail et al. (1977a, b), and later refined by Haq et al. (1987, 1988) and Ross and Ross (1988), for the Phanerozoic sequences, was based on the approximate correlation of seismic sequences from a number of passive continental margins. In 1989 Galloway proposed the model of genetic sequences bounded by maximum-flooding surfaces,which implied a certain discrepancy with the unconformity-bounded depositional sequences of Vail et al. (1977a) and Van Wagoner et al. (1987), based essentialy on seismic stratigraphy. Galloway's approach, based mostly on sedimentological interpretation of depositional systems, facies relationships and geometries, is particularly significant in stratigraphic successions with little or no available seismic data, due to difficulties in marking and tracing regional unconformities. Despite some controversies behind the main theoretical basis for the sequence stratigraphy paradigm (e.g. Miall, 1991, 1994, 1997), the method brought about a major revolution in the science of stratigraphy, leading to new research to be carried out on complex clastic and carbonate successions around the world. By gathering within a single stratigraphic framework information derived from diverse disciplines of sedimentary geology, such as seismic stratigraphy, biostratigraphy, paleoecology, paleogeography, and sedimentology, among others, the sequence models permitted a much broader, integrated and sharper research approach in basin analysis. In the past decades of the 20th Century new theories developed in the geoscience community which represent a synthesis of Lyell's Uniformitarism and Gradualism combined with a revival of Cuvier's Catastrophism, recognizing that both play a significant role in geological processes and the evolution of life. Theories such as the actualistic catastrophism (Hsü, 1983), the punctualism (Gould and Elderedge, 1977; Gould, 1984; Goodwin and Anderson, 1985), and the episodic sedimentation (Dott, 1983), are fundamented on the assumption that most of the stratigraphic record was produced during episodic events, and that abrupt environmental changes have modulated speciation and mass extinctions (e.g. Signor and Lipps, 1982; Flessa, 1986; Hallam, 1989a, b). Major catastrophic events, such as extraterrestrial impacts (e.g. Alvarez et al., 1980; McLaren and Goodfellow, 1990; Becker et al., 2001) and cataclysmic volcanic activity (e.g. McLean, 1985; Courtillot, 2000; Wignall, 2001) are also thought to have greatly affected the evolution of life on Earth. In 1982, G. Einsele and A. Seilacher discussed extensively the processes of cyclic and event sedimentation, introducing the principles of what would be later known as Event Stratigraphy (e.g. Kauffman, 1987, 1988; Walliser, 1996; Einsele, 1998). The method deals with the integrated study of episodic and short-term sedimentary and biotic processes in the stratigraphic record, and has the potential to improve substantially the resolution of geological correlations. Rhythmic stratigraphic cycles observed in pelagic siliciclastic and carbonate sequences have been related to the so-called "Milankovitch cycles", after the Serbian astrophysicist Milutin Milankovitch (1879–1958) who in 1941 presented a firm mathematical basis that related periodic variations in Earth's rotational and orbital motions (eccentricity, obliquity, precession) to long-term climate changes. However, the hypothesis of astronomically forced climate cycles was advanced already in the 19th Century to the Pleistocene ice ages by the French mathematician Alphonse Joseph Adhémar (1797–1862), in his work Les Revolutions de la mer (1842), and by the Scottish geologist James Croll (1821–1890), who in the 1860's and '70s proposed an Astronomical Theory of the Ice Ages,subsequently published in his Climate and Time (1875) and Climate and Cosmology (1885). These orbital-forced cycles control the intensity of seasonal and latitudinal distribution of solar radiation (insolation) reaching the planet's surface, and directly influence global climate, depositional processes and biotic productivity (e.g. Fischer and Arthur, 1977; Bottjer et al., 1986; Fischer, 1986, 1991; Schwarzacher, 1987; Fischer and Bottjer, 1991; Weedon, 1993; Satterley, 1996; Perlmutter et al., 1998). 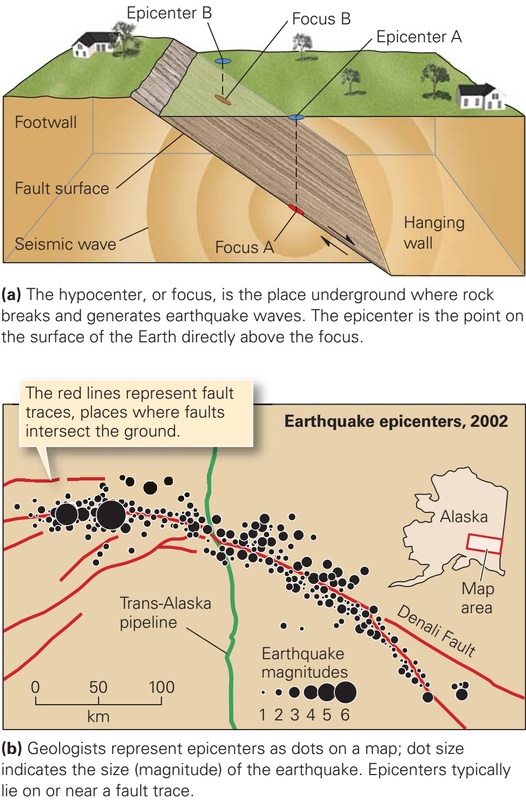 The detailed investigation of regular cyclic patterns in the stratigraphic record produced by the interaction of tectonic and Milankovitchtype climatic processes is the study of a new branch of stratigraphy named Cyclostratigraphy (Schwarzacher, 1993; Fischer, 1993, 1995; Gale, 1998). The method allows a way for estimating the time span of biozones and the magnitude of unconformities, improvement of the stratigraphic framework, and for a better understanding of sedimentary and climatic processes (e.g. Perlmutter and Matthews, 1989, 1992). For instance, the modern Neogene timescale now depends on precise orbital tuning of marine and continental cyclic sequences,and evolved into an astronomically tuned (polarity) timescale (APTS), which proved to be far more precise and accurate (e.g. Hilgen, 1991a, b; Wilson, 1993; Shackleton et al., 1995; Hilgen et al., 1995; Zachariasse, 1999). Chemostratigraphy is a relatively new technique, developed mainly during the last decade (e.g. Humphreys et al., 1991; Ehrenberg and Siring, 1992; Pearce and Jarvis, 1992,1995; Racey et al.,1995; Pearce et al.,1999). It uses the primary geochemical variation in the whole-rock elemental composition of siliciclastic sediments and sedimentary rocks to correlate stratigraphic sequences,as well as to gather inferences on basin paleotectonic history, source rock lithologies,depositional pathways,and paleoclimates. Over the last decade there have been a substantial number of works concerned with defining the Sr isotopic evolution of the oceans during the Jurassic, Cretaceous and Cenozoic (see Hess et al., 1986, and McArthur, 1998, for a review). Such a highresolution Sr-isotope curve can be used as a global correlation tool and, over some intervals, have a stratigraphic resolution superior to that of biostratigraphy. Recent research on isotope stratigraphy has also been forefront in defining and refining carbon- and oxygen-isotope curves for the Mesozoic and Cenozoic, based on the analysis of carbonate rocks and fossils and of terrestrial organic matter (e.g. Holser, 1984; Faure, 1986; Shackleton, 1985; Holser and Margaritz, 1989). The oxygen-isotope curve has been primarily used for estimating the Cenozoic record of water-mass temperatures (e.g. Frakes et al., 1992; McCauley and DePaolo, 1997). When of characteristic shape and form,the carbon-isotope curve can be used for intercontinental correlation (e.g. for sections across the Cenomanian–Turonian boundary; Kuhnt et al., 1990; Gale et al., 1993; Pratt et al., 1994), as well as to allow inferences on patterns of the long-term organic carbon cycle (e.g. Scholle and Arthur, 1980; Arthuret al.,1985),and hence to indicate important periods of petroleum source-rock deposition. The history of stratigraphy during the 20th Century is largely the history of the individual specialized branches as they developed into the traditional and new techniques by which they are recognized today. The earliest hint of plate tectonics was made around 1800 by one of Abraham G. Werner's most famous student, the German naturalist and explorer Alexander von Humboldt (1769–1859). Humboldt first suggested that the South American and African continents had once been joined, as apparent in their complimentary coastlines, but this proposal was largely ignored by the scientific community of that time. It would not be until the early 20th Century, in 1912, when the German astronomer, meteorologist and geophysicist Alfred Wegener (1880–1930) published his first works (Die Entstehung der Kontiente, Petermanns Mitteilungen, 1912, pp. 185–195, 253–256, and 305–309; and a somewhat different version with the same title in Geologische Rundschau, Vol. 3, No. 4, 1912, pp. 276–292) outlining his theory of "continental drift". After 1912, Wegener's work was interrupted first by an expedition to Greenland and then by the First World War. In 1915 Wegener published the first edition of Die Entstehund der Kontinente und Ozeane (The Origin of Continents and Oceans). In this book Wegener claimed that the continents had once been connected and formed a single supercontinent mass called Pangaea (from the Greek for "all the Earth"), about 300 million years ago,which had since split into pieces that have drifted to their present positions. As supporting evidence for the proposed theory Wegener noted the often matched large-scale geological features on separated continents, such as the close similarity of strata and fossils between Africa and South America and the close fit between their coastlines,and that fossils found in certain places often indicated past climates utterly different from today’s. Wegener’s revolutionary theory of continental drift took decades to win general acceptance among scientists, remaining controversial until the 1960's. For most of that lapse of time stratigraphy was to stand still, with no significant progress. In 1959 and 1962, Harry Hammond Hess proposed the sea-floor spreading or plate tectonics theory, subsequentely confirmed by Vine and Matthews (1963), which complemented Wegener's continental drift theory, and gave a much needed renewed impetus into the science of stratigraphy. Nevertheless, Wegener's basic insights remain sound nowadays and the same lines of supporting evidence are being continuously complemented and expanded by ongoing research. The stratigraphy is formed by Latin stratum and Greek graphia is the study of rock succession and correlation of geological events and processes in time and space. This is the fundamental for all geological studies and reconstructing the events of Earth's history and evolution of life on Earth. Stratigraphy knowledge is as old as philosophy which was originated by the ancients of Earth's natural phenomena and their philosophies on the nature of Earth's structure and processes. Different views were adopted among various ancient civilizations. The early observations were made by Ionian philosophers contributed mostly and to them the Earth's structure and processes were natural phenomena and not the supernatural causes. The term 'Fossil' comes from the Latin fossilis means anything dug from the Earth. Originally fossil was not used for living organism as we speak of today but for rocks, crystals anything that comes from Earth. At those early times there were two hypotheses generated for fossils. According to Greek philosopher Aristotle (384-322 B.C. ), he said that some natural forces makes shape of living organism from inorganic material that are preserved in the rocks. The organic view of the fossils was that they are remains of once living organism that are preserved and this idea was given even before Aristotle. In 6th and 5th Centure B.C. both Pythagoras (582-507 B.C.) and Herodotus (484-425 B.C.) 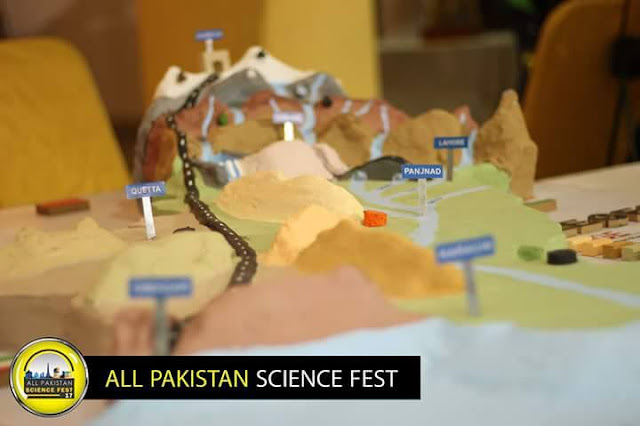 mentioned marine shells found on the mountain and on land places which were far from sea, argued this to be the remain of living organism which once were in sea later withdrew and became land. Herodotus thought that the disc shaped nummulitid foraminifera found in the Eocene limestone of which the Egyptian pyramids are built were lentils given to the slaves to fed who were building the pyramids and accidentally spilled and turned into stone. The Greek Xenophanes of Colophon, Ionia (570-480 B.C. ), a pre-Socratic Greek philosopher and Pythagorean reported the occurrence of marine shells on top of mountains and quarries. For them it was the proof that Earth keeps changing with time and the remains of extant forms were buried in the dried sea. The Romans gave more practical scientific accomplishments of the Greeks. Pliny the elder (23-79 A.D.) was a Roman naturalist and encyclopedist who was killed by eruption on 23-25 August 79 A.D. wrote a major encyclopedia of natural sciences which included 37 volumes and contained a summary of ancient knowledge on the nature of physical universe, a work mostly swimming up what the ancient Greek authors have written. In the early centuries after Christ the idea of organic origin was accepted and spread out. By the fall of Roman Empire in the 5th Century the knowledge was passed out to Muslims. All of the Greek work was translated into Arabic and then further added to them. During the middle ages and the Renaissance, the Aristotelian school, through a Muslim, the Persian philosopher and physician Ibn-e-Sina (Avicenna, 980-1037), influenced many European scholars who attributed the occurence of fossils to failed abortive attempts of a natural creative 'plastic force' to shape living organism in a process of spontaneous generation of life. The scientist, philosopher and thelogian (1206-1280), born at Lauingen, Swabia, and later Leonardo da Vinci (1425-1519), were the first to correctly speculate on the nature of fossils as the remain of once living ancient organisms. The Leicester Code is a collection of numerous manuscripts with handwritten notes of Leonardo's scientific and technical observations. Among them there are drawings of rock formations and of various fossil shells (mostly Cenozoic mollusks), which are probably recollections of his experiences and observations on the hills of Tuscany, Romagna or the Po River plain, during his service as an engineer and artist at the court of Lodovico Sforza, Duke of Milan, from 1482 to 1499. From his notes Leonardo appears to have noticed the mechanisms of sedimentary deposition on mountains and rivers, the role that rivers play in the erosion of land and the principles of the law of superposition, which would later be demonstrated fully by Nicholaus Steno in 1669. He also appear to have grasped that distinct layers of rocks and fossils could be traced over long distances, and that these layers were formed at different times. After Leonardo's death his notes were scattered to libraries and collections all over Europe. While portions of Leonardo's technical treatises on painting were published as early as 1651, the scope and caliber of much of his scientific work remained unknown until the 19th Century. Yet his geological and paleontological observations and theories foreshadow many later breakthroughs. Nearly three hundred years later, the rediscovery and elaboration of these principles would make possible modern stratigraphy and geological mapping. Georgius Agricola, latinized form of Georg Bauer (1494-1555), a physician and geologist born in Glauchau, province of Saxony, made fundamental contributions to stratigraphic geology, mineralogy, structural geology, and paleontology. His greatest work, De Re Metallica ("On the Nature of Metals"), posthumously published in 1556, is a systematic study of ore deposits and of strata, and was to remain the standard text on mining geology for two centuries. 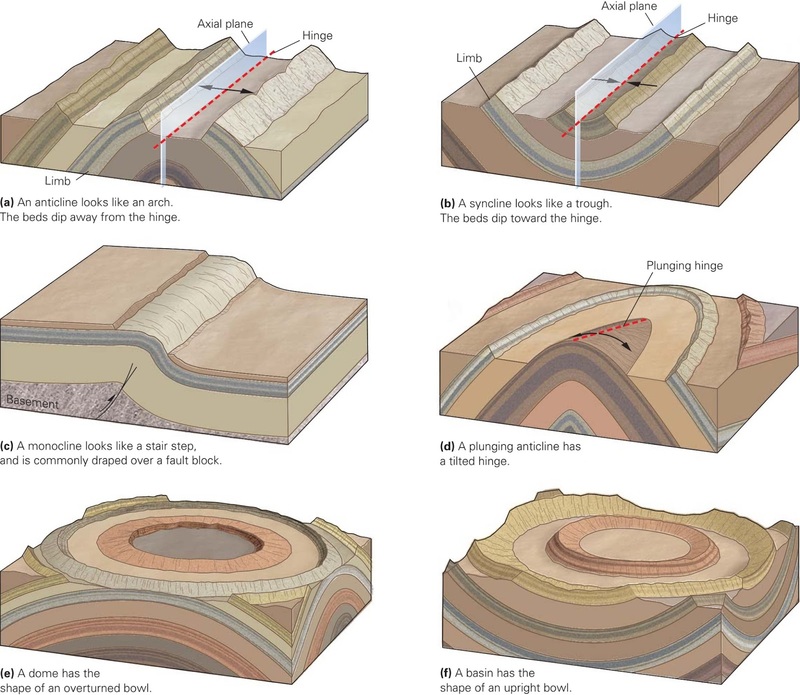 In his profusely illustrated book Agricola noted that rocks were laid down in definite layers, or strata, and that these layers occurred in a consistent order and could be traced over a wide area. Agricola's observations would become important in understanding the arrangement and origins of the rocks of the Earth. Agricola is considered the founder of geology as a discipline. In the mid-16th Century the first engravings of fossils were published by the Swiss physician Conrad Gessner (1516-1565). Nicholaus Steno, latinized form of Niels Stensen (1638-1686), a Danish anatomist and geologist, who in Italy was converted to Roman Catholic faith and became a Roman Catholic prelate, pointed out the true origin of geological strata and of fossils. He wrote the first real geological treatise in 1667, while living in Tuscany, Italy. In 1669 he was the first recorded person to apply to the study of a sedimentary rock outcrop what is now referred to as Steno's law of superposition which states that layers of rock are arranged in a time sequence, with the oldest on the bottom and the youngest on the top, unless later processes disturb this arrangement, his most famous contribution to geology. In addition, Steno postulated other general principles of Stratigraphy: the principle of original horizontality, which states that rock layers form in the horizontal position, and any deviations from this position are due to the rocks being disturbed later; and the principles of strata continuity (material forming any stratum was continuous over the surface of the Earth unless some other solid bodies stood in the way) and cross-cutting relationships (if a body or discontinuity cuts across a stratum, it must have formed after that stratum). The data and conclusions of Steno's work on the formation of rock layers and fossils were crucial to the development of modern geology, and were enough to have earned him the title of 'Father of Stratigraphy'. Steno's contemporaries, the British natural scientists John Ray (1628-1705), Robert Hooke (1635-1703) and John Woodward (1668-1728),also argued that fossils were the remains of once-living animals and plants. However, the opinion was still universal that fossils represented life destroyed by the Universal Flood, a theory championed especially by the Swiss naturalist Johann Jakob Scheuchzer (1672-1733). Robert Hooke was perhaps the greatest experimental scientist of the seventeenth century. He was the first person to examine fossils with a microscope, to note close similarities between the structures of fossil and living wood and mollusc shells, and to observe, two and a half centuries before Darwin, that the fossil record documents the appearance and extinction of species in the history of life on Earth.